Christmas at Disney World is my absolute favorite time of year. We love the resort decorations, Mickey’s Very Merry Christmas Party, and the special events at the parks and Disney Springs. Disney Springs is a popular rest day destination with year-round shopping and restaurant choices. During the Christmas season, Disney Springs adds several Christmas activities to their offerings. One of their biggest Christmas offerings is the Disney Springs Christmas Tree Trail. The Disney Springs Christmas Tree Trail is a seasonal area where beautifully decorated Disney-themed Christmas trees are showcased. The Christmas Tree Trail winds its way through dozens of Christmas trees with pretty lighting, Christmas music, and occasional “flurries” to get you in the Christmas spirit. For the 2018-2019 Christmas season there are 27 Christmas trees along the trail. 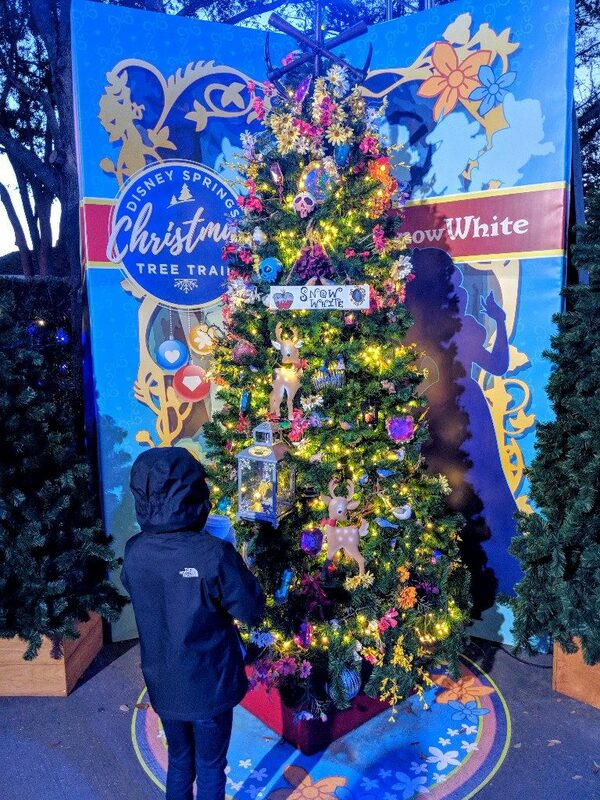 When Is The Disney Springs Christmas Tree Trail Open? The Disney Springs Christmas Tree Trail generally opens in early November and runs until about the first week of January. 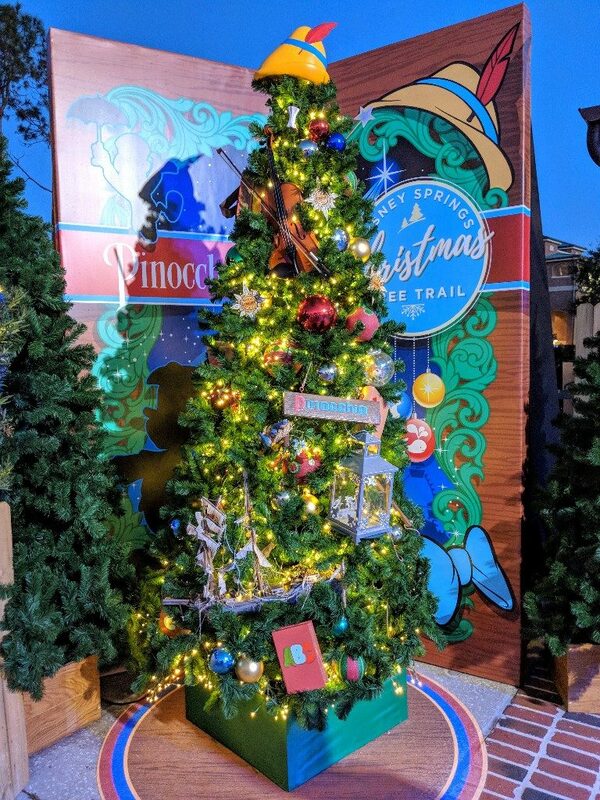 This Christmas season the Disney Springs Christmas Tree Trail is open November 8, 2018 through January 6. 2019. Earlier this year we were so excited that this Christmas activity was still available after the New Year. This meant we were able to grab dinner at Disney Springs and visit the Christmas Tree Trail before our Disney Cruise early in January. Who doesn’t love stretching out Christmas? There is also a special ornament in a lantern on each tree showcasing ones that are available for purchase at Disney Springs. This way you can take some of the Christmas Tree Trail magic home for your own tree. 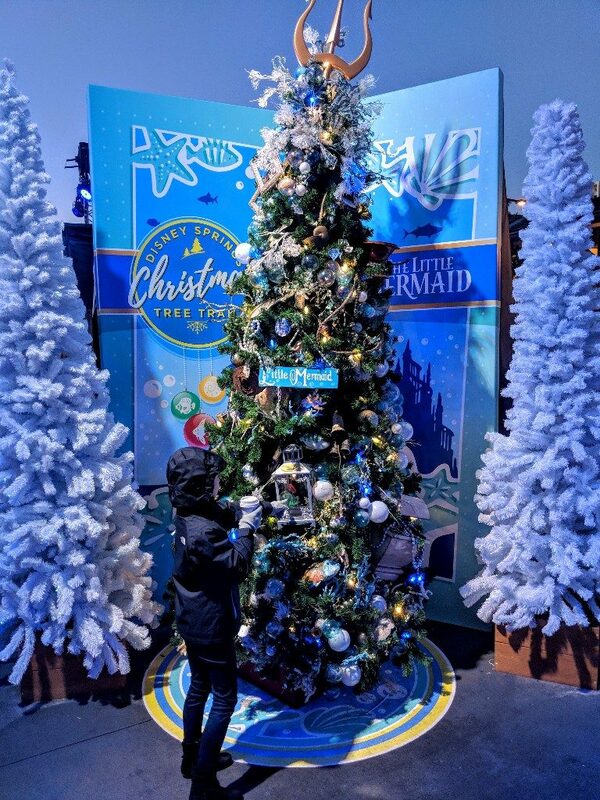 Check out the top of The Little Mermaid tree and you’ll see King Triton’s trident instead of your more traditional star or angel. Not surprisingly you will also find fish, shells, rope, and iridescent ball ornaments that resemble bubbles on The Little Mermaid tree. 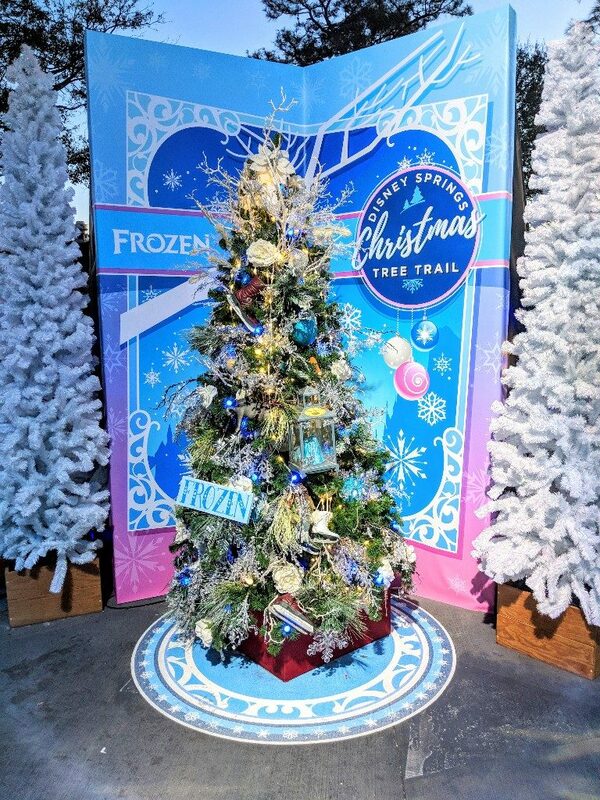 Snowflakes, “ice” coated decorative branches, and ice skates are featured on this tree inspired by Elsa and Anna from Frozen. I love that in addition to white lights there are also some blue lights to give it an extra Frozen feeling. Snow White’s tree has so many fun details. I was stoked to find call outs to my girl, The Wicked Queen, on the Snow White tree. There were poison apple and magic mirror ornaments in addition to glittering jewels to represent the seven dwarfs mine. There are also flowers and woodland creatures all around the tree. The “star” is 3 pickaxes that form a circle. Pinocchio is a sentimental favorite of mine, and I thought there were some cute details on the Pinocchio tree. Pinocchio’s hat tops the tree and just below is Geppetto’s violin. Look for Geppetto’s wrecked ship and Pinocchio’s school books, too. I am a big fan of Disney Villains. There would be no story without a villain! 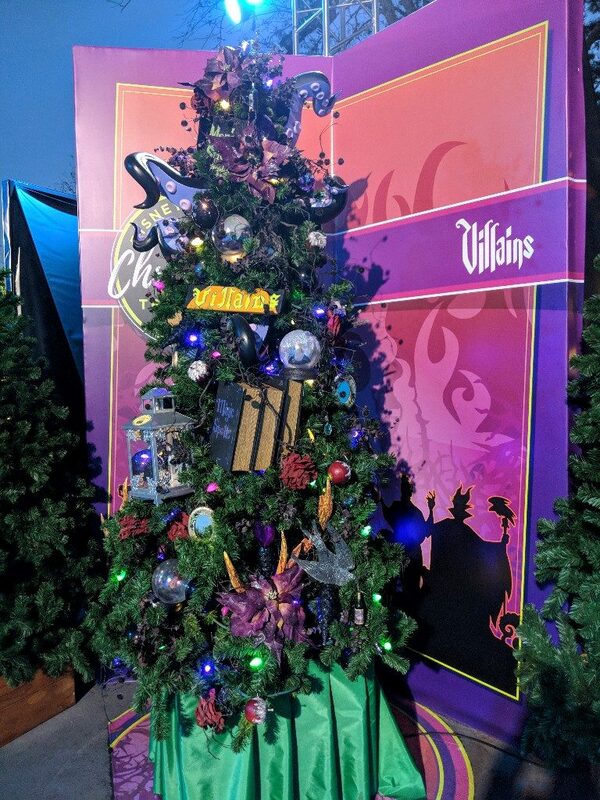 The Disney Springs Tree Trail Villain tree had Ursula’s tentacles peeking from between branches, ornaments with several villains, some spell books, and my favorite – a reference to Maleficent. If you look closely near the bottom of the tree there is a bunch of purple flowers with two horns emerging from them. 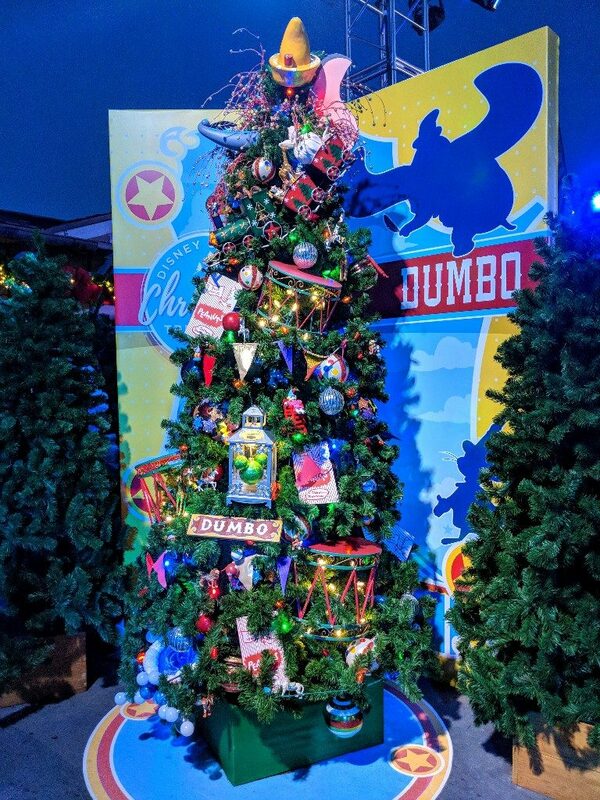 The Dumbo tree starts strong with Dumbo’s hat at the top and a peek of his trunk and ears in between the branches. There is also a train to represent the Casey Jr. Circus Train, peanut boxes, and circle stands that look like the platforms the animals perform on during the movie. This Alice In Wonderland tree has borrowed the Mad Hatter’s hat as a tree topper. Look closely and you can see the Cheshire Cat’s eyes and smile as he fades from view. Teapots, teacups, paint brushes, and half-painted roses finish out the decorations on this whimsical tree. 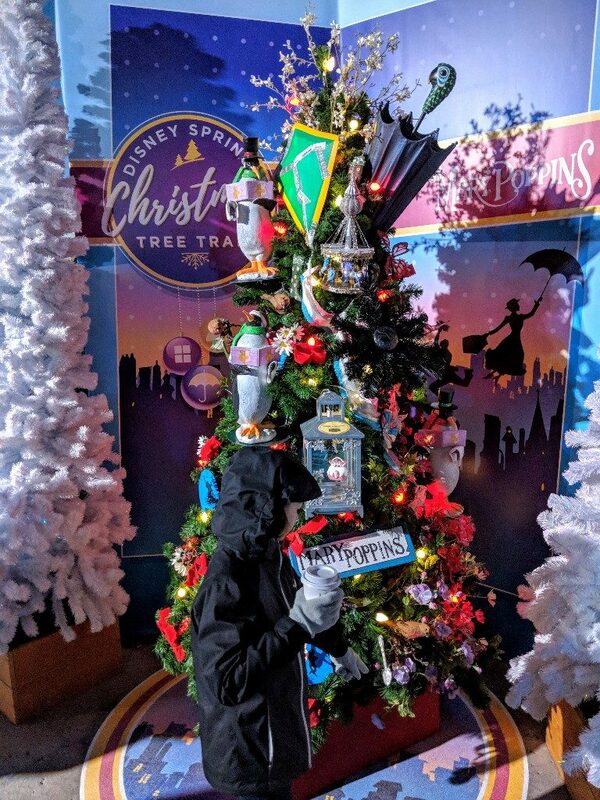 The Mary Poppins tree was practically perfect in every way! In fact, it was my absolute favorite tree on the Disney Springs Christmas Tree Trail. This tree has so many nods to the iconic movie that I’m sure I missed some of the details. The repaired kite and Mary’s memorable umbrella are two of the biggest decorations on the tree. We also spotted a carousel, part of Mrs. Banks’ suffragette sash, penguins, and a spoon with some sparkly sugar. Visiting the Disney Springs Christmas Tree Trail is a great Christmas time rest day option at Disney World. Or in our case a fun way to extend our holiday celebration before a Disney Cruise. The exact theme for the trees and the decorations can vary year to year. 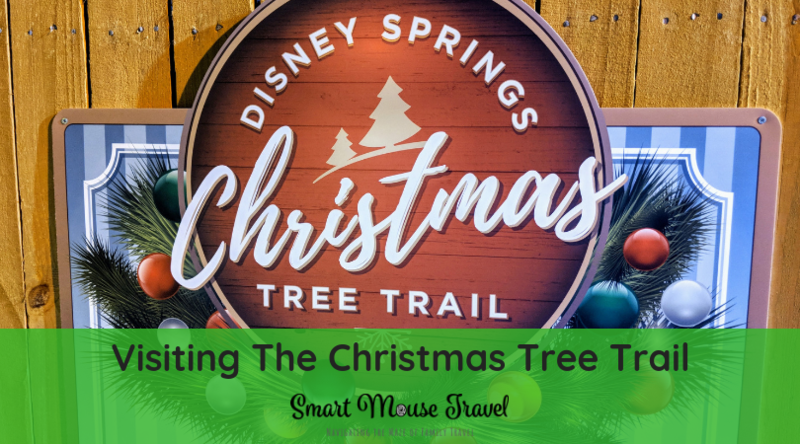 This article is meant to inspire you to walk the Christmas Tree Trail if you are celebrating Christmas at Disney Springs. Check here for more information on other Christmas offerings at Disney Springs. 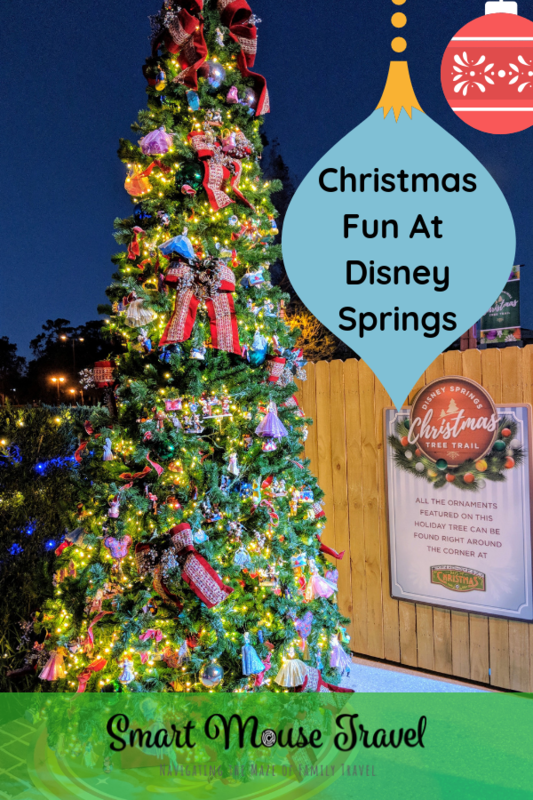 Walking the Disney Springs Christmas Tree Trail is a fun and free way to celebrate Christmas at Disney World. 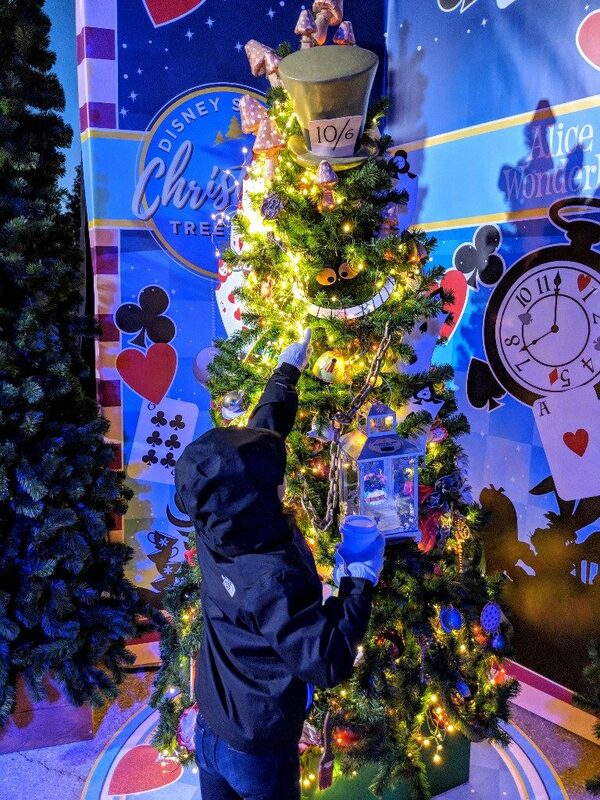 See some of our other favorite Disney World Christmas activities like Mickey’s Very Merry Christmas Party or general tips for visiting Disney World at Christmas.